Everyone has a travel beach memory, whether it was a childhood trip, where he proposed, where you spent your honeymoon or a summer abroad. Dune Jewelry captures those memories from where you've been, where you love and where you're going. Select a sand from your favorite beach, ballpark, golf course or trail from Dune Jewelry's extensive sand bank to be hand crafted by Sand Artists into a one-of-a-kind piece. Every piece of jewelry is custom made to order, using the highest quality materials sourced from around the globe. Click here to view Dune Jewelry's list of all available beaches. One Sterling Silver Necklace featuring Your Chosen Sand. Gift Box Includes Information Card and Jewelry Care Instructions. One sand choice per order. Items ship within 10 business days. Due to the custom nature of this gift, Dune Jewelry sales are final. Specific sands may become unavailable at any point. Dune Jewelry reserves the right to update and discontinue sands, as necessary. Sandglobe Pendant Measures 10 mm. Gift Box Measures 3" x 4" . Originally from Cape Cod, Holly Daniels Christensen has traveled to beaches all around the world and realized that nearly everyone has a special memory or exciting adventure that took place on a coast of New England, a beach in California, or the shores of Italy. Using the unique colors and grains of the world's sands as her palette, she designs unforgettable jewelry for those who wish to hold on to their favorite memories forever. Serving more as precious keepsakes than decorations, Dune Jewelry's custom designs are the perfect gift to hold a special beach in your heart. if ordered by 3:00 am EDT Saturday April 27th. Fine Sterling Necklace with Custom Sand is a hand delivered gift. These gifts are delivered by one of our local design centers located throughout the United States and Canada. Same day delivery is available for most gifts when ordered before the cutoff time. The cutoff time for Fine Sterling Necklace with Custom Sand is in the recipient's time zone. 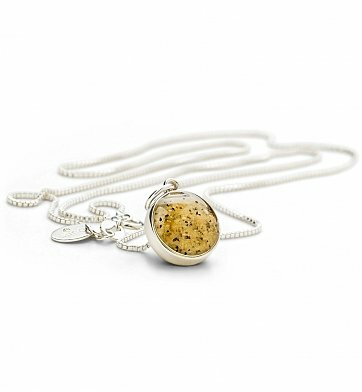 Sterling silver necklace holds a pendant filled with sand from your chosen location. Arrives presentation-ready with gift box and description card. A limited edition creation from Dune Jewelry of Massachusetts.